This chapter covers different ways to find information you've stored in jManage. Two of the techniques in this chapter - finding contacts and the "search-action" workflow, described in the second bullet below - are core functions in jManage, so most, if not all, users will find this chapter helpful. We will start off with some simple searches and then move on to more advanced techniques. jManage beginners should be familiar with Quicksearch, Advanced Search and the component searches. More advanced users should also look at reports, custom searches and Search Builder. To find a specific contact: the Quick search box can find contacts by name, email address or a variety of other characteristics. To perform an action on a contact or contacts that meet certain criteria: a common workflow in jManage, called a search-action, is to find contacts that meet certain criteria and then perform an action on them. For example, you might want to find all contacts in the Board Member group in order to invite them to a meeting, find all those whose memberships have recently expired to send a renewal reminder, or find all contacts aged under 25 in a specific location to send them an email about an upcoming event nearby. As a form of ad-hoc reporting, searching is often useful but does have limitations. For example, you can't group results by particular criteria, summarize, or easily produce graphs of the results. For more advanced reporting, see the Reports section. organizations with Peter in their name, e.g. Alpeter Community Centre. You don't need to type the full name of the person - just the first few letters. Note: If you search by phone then you will need to enter the digits of the phone number without any formatting. The phone search is done against a field that consists only of digits with all non-numeric characters stripped out. Advanced search allows you to search across all the information you have about your contacts. For example, you could find "all contacts in New York City" or "all advisory group members". If you specify two or more categories of information, the search displays every contact that matches all the categories. For instance, you can combine the two criteria just mentioned to find "all advisory group members in New York City". The Advanced search screen is accessible from the navigation menu Search > Advanced Search. On this screen, search criteria are grouped into sections which refer to different types of data that you can search on, such as address data, notes and information from components such as Contributions or Events. Each group of criteria is shown as a blue bar (known as an "accordion" because it expands when you click on it). 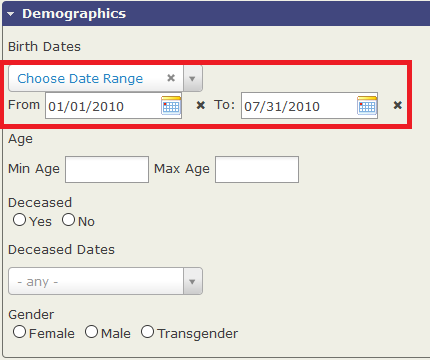 For example, if you want to search for all people in your database from 16 to 18 years old, click on the Demographics accordion. When it opens, you can specify the birth date range you are interested in. Advanced Search returns your results as Contact records by default. However, you may want to get another record type instead. For example, you may want to search on the Membership renewal activity to find everyone who renewed their membership last week then display the results as Memberships so that you can export name, address and Membership expiration date to create and then send out membership cards to those contacts. Simply select the record type you want from the Display Results As dropdown. For example you may want to include columns for Gender and Date of Birth, while eliminating Country. 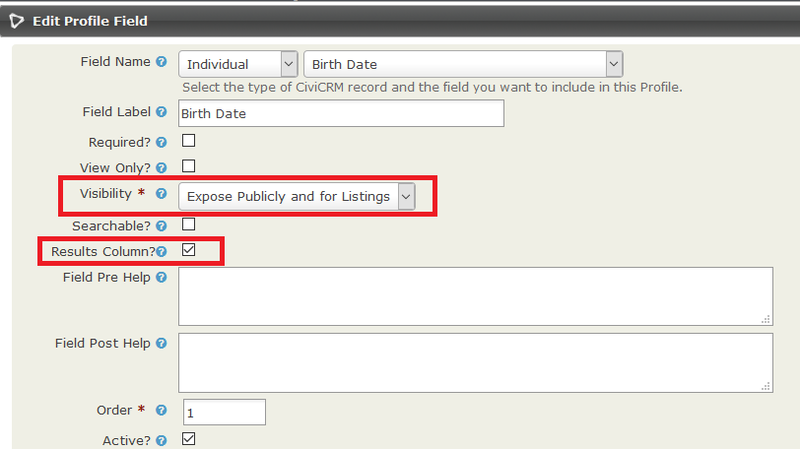 Create a profile that includes birth date, gender and address fields. Read more about creating profiles in the Profiles section of the chapter on Organizing Your Data. Combining this feature with the "Batch Update via Profile" action provides a powerful method of viewing and updating a specific set of fields across a batch of contact records. The Search Operator determines whether your criteria are combined with AND statements, or combined with OR statements. For example, you may want to find all individuals who are in the Volunteers group AND who have a Volunteer Training activity recorded for them. In this case use the AND operator. If you need to find everyone who is in the Volunteers group OR has a Volunteer Training activity recorded, use the OR operator. The Search in Trash allows you to search contacts that have been deleted but not deleted permanently. When a contact is deleted, the contact and all related data are moved to trash. Only users with the relevant permission will be able to search in trash and will be able to restore the contact from trash. by using a relative date range, e.g. 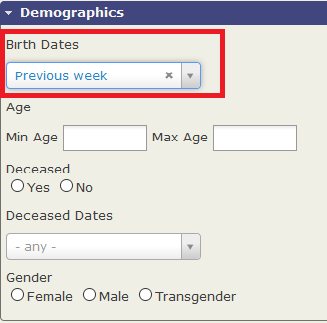 "Previous week"
Relative date ranges are especially useful for searches that you would like to then save as Smart Groups (automatically populated groups that are configured to include contacts that share a certain set of characteristics or activities). For more information see the Groups and tags chapter. Relative dates filters based on the time interval "week" assume that Sunday is the first day of the week. This is not true in all countries, for example Europe and many countries in Asia/Pacific region consider Monday to be the first day of the week. To set which day is the first day of the week, you need to go to Administer >> Localization >> Date Format. Different criteria are combined by "ANDing" them. For example, if you select the tag "major donor" and the country "Mexico", the search will return major donors from Mexico. The search will not return major donors who are not from Mexico, nor those from Mexico who are not major donors. You can change the default search operator from AND to OR in the Search Settings. Within criteria groups that allow you to check boxes for more than one value, these options are also combined by "ANDing". For example, if you can search for contacts whose Preferred Communication Method is both Email AND SMS. With fields that allow you to select more than one value from a dropdown list, the values are always combined with "OR". For example, you could find contacts that live in Alaska or in Arizona. Advanced search lets you choose from a wide range of criteria in a user-friendly panel, but this has limitations. Search builder allows you to define your own search and arrange the criteria according to your specific needs. = Equals. Matches on the exact value you specify "First Name" = "Bob" will find contacts who's first name is exactly "Bob"
Your search results will contain each contact's name, plus a column for each search criteria you've defined. If you export search results, the export file will contain those same columns. Just like other searches, you can choose from a list of actions to apply to the results of your search. If you export results, you can select fields for export. Note that the fields you searched on will get exported by default in addition to those you select. You can also save your Search Builder search as a Smart Group. For more information on Smart Groups, see the Groups and Tags chapter. You can use this to search for text values all fields of the database. This is particularly useful, for example, if you can remember specific words that you have used but can't remember where you have put them. For example, lets say that you recorded an activity with a contact and added specific words to the description but have now forgot the contact's name. You can use Full text search to find the contact and activity by words that you remember from the description. Most jManage components offer a search on the data they maintain, such as Find contributions, Find members, etc. These forms work in a similar way to Advanced search but return rows of the main objects associated with the components, instead of contacts. Find Members returns memberships, Find Participants shows event registrations, Find Contributions returns contributions and so on. Each component search has its own Action list. See the Component sections for more details. Note that you can also use the Advanced search in conjunction with Display Results As to search for component objects based on criteria available in advanced search. For example, you could find all event attendances from contacts that are also members. Custom searches are designed to answer specific questions that can't be easily answered using Advanced Search or Search Builder. Go to Search > Custom Search in the navigation menu and look at the list of available custom searches.These customized searches have been written by members of the CiviCRM community to meet their own needs, and then contributed back to the community to share with others who need the same or similar custom searches. It's worth spending some time exploring these searches as some may be useful to you, and they will give you an idea of the sorts of things that are possible. Though some of these searches can be done in the Advanced Search (especially in later versions), custom searches are also set up to display results according to your search and may provide more useful columns in the results for your needs. Here's a short description of the custom searches available. This is probably the most popular custom search. When using Advanced Search, if you select several groups in the Group list near the top, it will treat the search as an OR search, and return results for contacts who are in any of the groups you select. If you want to find contacts who belong to all of the selected groups, you will need to use Search Builder. There is also a very useful built-in custom search, "Include/Exclude Contacts in a Group/Tag", that enables you to find contacts who are in one group but not in another, which you can find by going to Search > Custom Searches in the navigation menu. By combining Include and Exclude options, you can find contacts who are in one group but remove just the group members who fit another criterion. For example, you may want to find all the contacts who are Newsletter Subscribers or volunteers, but exclude members of Advisory Board, perhaps to create a new mailing list to receive a message targeted at the most external circles of your constituents. Search households in a state or province. Note: which states or provinces are available in the search depends on your localization settings. Add additional countries by going to Administer > Configure > Global Settings > Localization. Add to the column of "Available States and Provinces", but note this change will also affect profile forms which include country or state/province fields. Find aggregate totals of contributions from contacts within a range of dates. Search for contacts in a given group and display results with mailing information. Use this search to batch update contact information, send an email, export contacts, or other actions. Search for contacts located within x miles/kilometers of a specific geographical area. Enter the distance in miles or kilometers. Enter the country within which you want to search. Enter any other parameters you wish to give your search. TIP: You can also incorporate Proximity Searching in a profile which you've configured for use as a search form. Search on event-related payments for a given event or event type in a given date range. You may also limit results to show credit card payments only or payees only. See also event reports for more useful event search options. Find activities using any or all of the activity-related criteria. This is also possible in Advanced Search by using Display results as. Get detailed information about which participants opted for which different paid options related to an event. For example, see who paid just the event fee, who paid for the additional workshop and who paid for dinner. Search on any tag for contributions within a range of dates. Find contacts in a specified zip code or postal code range. This is useful for targeted mailings or conducting surveys in a particular geographical area. Go to Search > Custom Searches > Zip Code Range. Enter the start and end range of the zip or postal codes. Search for contacts that have been added within a particular time period. Including a group displays just those added within the specified time frame who are also in that group. Excluding a group removes those group members from the results. A search for multi-value custom data. Search for contributions that have been made in one year but not another. This is useful for following up semi-regular donors and encouraging them to donate more regularly. See also the LYBUNT and SYBUNT reports. None of the fields are required; you can choose whether to search a specified amount range as well as a time period, and whether you want to exclude minimum or maximum amounts. After you retrieve your search results, you can perform a number of actions. An Actions box appears above the results. You can select either all records or specific records, then carry out an action with the selected records. Different actions are covered in more detail in the chapter on Everyday Tasks. Some of the most commonly used actions are Add Contacts to Group, Export Contacts, Map Contacts, and creating and printing Mailing Labels. (To use Map Contacts, you will need to configure Mapping and Geocoding. You can read more about this in the Installation chapter of the Configuration section of this manual). For example, to send email to a selected number of contacts, mark the contacts you are interested in and then select Send Email to Contacts in the dropdown list of actions. You can see a pop-up box with detailed information for any contact listed in your search results by hovering over the contact icon in the left column, as shown below. You can adjust the fields shown in this "pop-up view" by modifying the fields included in the "Summary Overlay" profile (Administer > Customize Data and Screens > Profiles). Understanding wildcards greatly expands your search options. A wildcard represents any character (letter, numeral or punctuation mark). In jManage, the wildcard is represented by the % symbol (you may be familiar with other symbols such as * from other applications). It is most easily understood through examples. Suppose that somebody asked you to find a contact with a first name similar to "Michael", but possible something different such as "Michelle" or "Michał". If you search for "Mich%" you will find all these variations, including a contact who is supposed to be named "Michael" but whose name was misspelled as "Micheal". Wildcards can be used before, after, or even within words. For example, searching on 'Mich%el' will exclude "Michał" and "Micheal" but still find "Michelle" and "Michael". Note that when you search for character strings, the search is not case-sensitive. For example, if you search for 'brooklyn', the search will return strings with capitalised letters if the string exists, e.g. 'Brooklyn' or 'BROOKLYN'. Entering "mi%el" in lowercase will also find contacts with an upper case 'M' in their name.